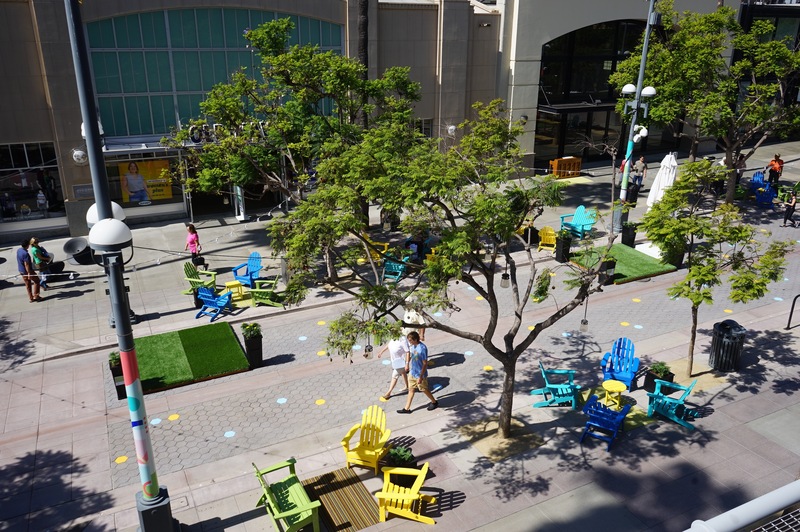 It's being called "The Experiment," Downtown Santa Monica, Inc.'s latest attempt to breathe new life into the northern block of the Third Street Promenade by adding moveable street furniture, elevated grass patches and colorful decorations. The pilot project incorporates proven practices in urban placemaking that have been used in New York's Times Square and in downtown Denver to help make areas more inviting for people. By adding moveable furniture, public art or other decoration, and programming like live music, spaces that are designed for strictly shopping or the movement of goods can be transformed into lively public spaces where people choose to gather and interact, thereby creating a new community gathering space. While the promenade was initially designed as such, its linear orientation and reputation as an outdoor mall have, over time, eroded its original intention to serve as Santa Monica's living room. DTSM, Inc.'s goal is to study and gather feedback from the public on what new elements they like from The Experiment to better inform new investment into the promenade, which will turn 30 years old in 2019. 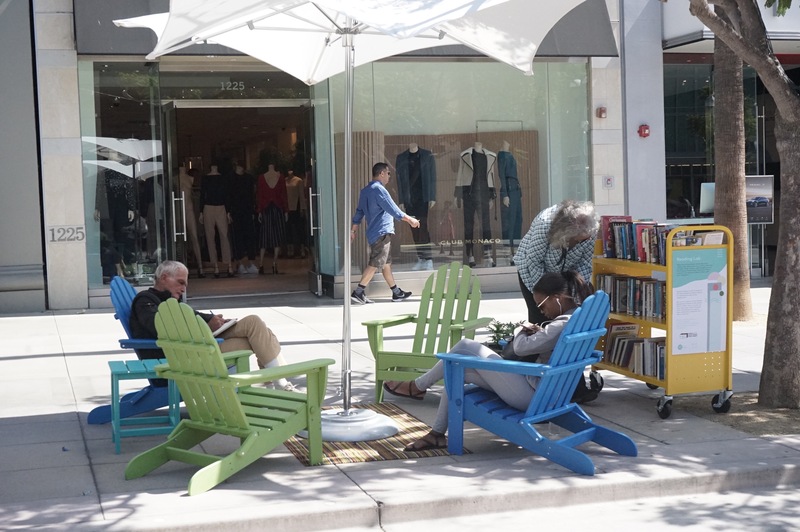 The City of Santa Monica and DTSM, Inc. have funded a joint effort to assess the promenade's infrastructure needs and see how people use the space. The effort is part of the Promenade 3.0 revisioning process to make sure it remains a popular community gathering space for the next generation of Santa Monicans. As more people choose to spend money on experiences, with dining being a significant driver, it's key to create places that offer those opportunities instead of relying solely on the retail component. "It's a placemaking project," said DTSM, Inc. Deputy Chief Executive Steven Welliver. "We want people to continue to choose the promenade as a place not just to shop, but to spend time and hang out. We are creating a space that helps people connect with one another. We want people to choose the promenade not because of a particular store, but because it's a cool place in general." Those who visit The Experiment will be able to play a piano, lounge on moveable platforms featuring Astroturf, challenge friends to a game of ping-pong or giant Jenga, or just sit and enjoy the sea breeze and sunshine. Colorful rugs and sun shades will help make the space more comfortable. Those familiar with DTSM, Inc.'s summer series Picnic on the Promenade, which features pastel-colored tables, chairs, classic board games and music, will recognize some of the elements. The current street furniture on the 1200 block will be removed as part of the project. "Studies have shown that if people can move a chair, even if it's just one inch, it becomes theirs and they tend to linger longer in a space because they have adjusted it to their preference," Welliver said. Other decorative elements will make the northern end of the promenade stand out from the rest. Guests will be asked to provide their feedback using an online survey tool and "Happy or Not" kiosks. Businesses will also be consulted to learn how the changes have impacted sales. "It's the next chapter for downtown and Third Street Promenade," said DTSM, Inc. CEO Kathleen Rawson.